Imagine a world where biomass can be used to produce energy and high value added products while sustainable carbon farming and processing technology take CO2 from air and put it back into the ground. As the UN’s annual climate change conference, COP23, reaches its climax, Dr Mirijam Roeder, from The University of Manchester’s School of Mechanical, Aerospace & Civil Engineering and Tyndall Centre for Climate Change Research, outlined why bioenergy is a key renewable energy source for a carbon neutral feature. Another fundamental benefit of bioenergy is that it’s the only renewable energy that can take CO2 out of the atmosphere. This is because many forms of biofuel involve crops, trees and plants and all of these need CO2 for photosynthesis. That is why all the Intergovernmental Panel on Climate Change’s (IPCC) scenarios that keep the planet below the 2°C global warming target have massive amounts of bioenergy with carbon capture and storage (BECCS). Potentially growing biomass plantations, with relatively low costs and soil benefits or even with carbon negative results and BECCS solutions can help to produce cheap energy and high value-added products, is completely demonstrated in several case studies such as those of The Supergen. The University of Manchester along with other institutions, through The Supergen Bioenergy Hub, are pioneering an interdisciplinary approach to bioenergy, bringing together industry, academia and other key stakeholders, to ensure bioenergy has a sustainable future and renewable tomorrow. (Top) A deep decarbonization scenario scientifically consistent with the Paris Agreement (3) and its associated carbon fluxes as computed with a simple carbon cycle and climate model (13). 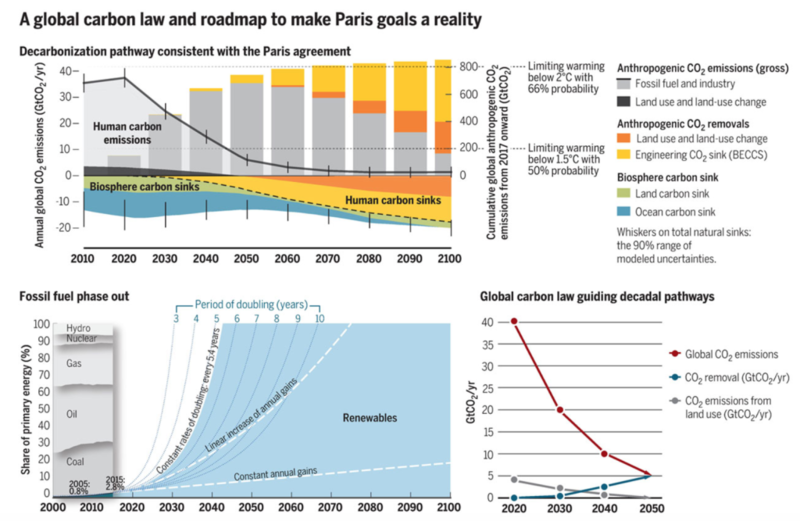 The “carbon law” scenario of halving emissions every decade is marginally more ambitious than the scenario presented. Meeting the Paris Agreement goals will require bending the global curve of CO2 emissions by 2020 and reaching net-zero emissions by 2050. It furthermore depends on rising anthropogenic carbon sinks, from bioenergy carbon capture and storage (BECCS) engineering (yellow) and land use (orange), as well as sustained natural sinks, to stabilize global temperatures. This scenario is broadly consistent with a 75% probability of limiting warming to below 2°C; a median temperature increase of 1.5°C by 2100; estimated peak median temperature increase of 1.7°C; a 50% probability of limiting warming to below 1.5°C by 2100; and CO2 concentrations of 380 ppm in 2100. See supplementary materials (SM). (Bottom left) Nonlinear renewable energy expansion trajectories based on 2005–2015 global trends (13). Keeping the historical doubling times of around 5.5 years constant in the next three decades would yield full decarbonization (blue area) in the entire energy sector by ∼2040, with coal use ending around 2030–2035 and oil use, 2040–2045. Calculations, based on (5), are detailed in SM. (Bottom right) Decadal staircase following a global carbon law of halving emissions every decade, a complementary fall in land-use emissions, plus ramping up CO2 removal technologies. Albert Bates gives an enthralling presentation at APC 11 about the global potential of Biochar to sequester carbon, improve degraded landscapes, and provide for humanity’s needs while restoring environments which we have destroyed. 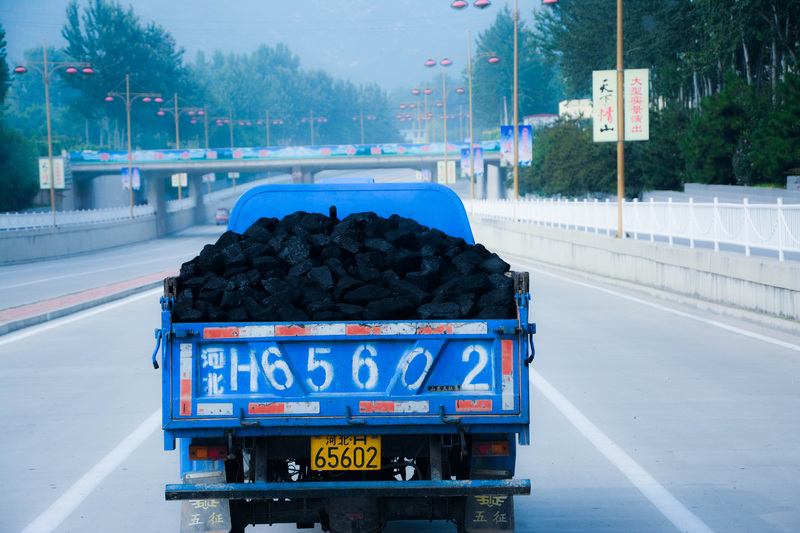 Biochar is laid out as a powerful tool for growing food and forests, and fighting climate change. Patricia Thornley, Professor of sustainable energy systems, discusses a unique collaboration between artists and researchers working at the cutting-edge of bioenergy in creating a graphic novel which aims to answer some of the big questions around bioenergy and climate change. Bioenergy: A Graphic Introduction was put together by northern artists, who have interpreted discussions with scientists from the Supergen Bioenergy Hub in a series of striking images which imagine alternative futures and explain some of the technology involved and how it might be put into practice. Why bioenergy crops (already) met expectations? One of the major “issues” that I have some concern about over the long-term, as it relates to the overall (long-term) sustainability of bioenergy has to do with the balance between growing “crops” for food and growing crops for bioenergy, but my concern has less to do with land use and more to do with issues around “peak phosphorus” and the global non-carbon geochemical balance of other ‘nutrients’ (elements) of practical significance to both our ability to sustainably supply biomass well into the future (for generations of humans and all other animals of this planet) as well as to support the huge variety of biodiverse ecosystem functions that are essential to maintaining a viable / funcational ecosphere (and all of the related “ecosystem services”, whether related to the economics of the physical, mental, emotional, or spiritual realms, and whether or not they are related to economics, ethics, energy, or health — or all of the above). Thanks for your comment Lloyd. There is no problem food vs energy because food is not linked to arable acreage but to productivity. Land available has remained stable since 60s and FAO expects 3 billion hectares available for non-food purposes. Regarding nutrients, we use organic amendments from biomass waste streams near farms, or from our own biomass. P is balanced as well as other nutrients. We use ash, digestate or biochar depending on technology considered. Regarding maintaining functional ecosphere it would be relevant to understand that the world is under degradation, desertification, erosion, nutrient and groundwater depletion, etc. If biomass crops are options to provide ecological services as any perennial systems, create employment in a regional perspective, valorize natural resources including biomass wastes and start replacing fossil energy or synthetic fertilizers, you are much better than scenario today (where we are simply using coal and gas, putting more CO2 to air, tilling land with non sustainable practices, deforesting, exceeding our quota of water, etc.